Thank you for contacting us! We really appreciate hearing from you. 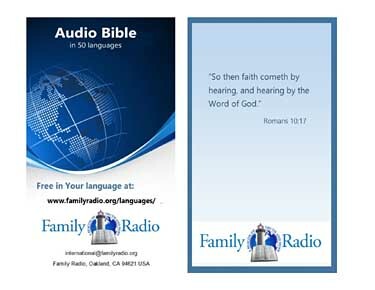 Thank you for contacting us regarding your recent reception of our New York City radio station WFME AM 1560! How exciting to know you're able to pick up our signal in France! I listened to your audio clip on youtube and can positively confirm the accuracy of your detailed reception report! I'm sorry that due to our small staff, we no longer send out QSL cards as we did in the past, but feel free to print and keep this email in your records as positive confirmation of your report. Thank you again for contacting us and may you have a blessed and very merry Christmas and best to you this coming year! Pas JO en plus Family Radio, peut-être la même qui émettait en OC. Je ne sais pas si c'est la même qui émettait en OC ! 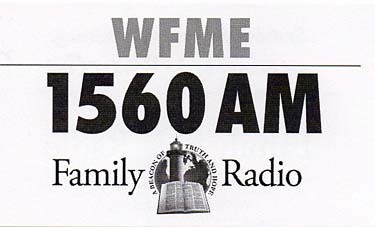 Yes, WFME AM 1560 is owned and operated by Family Stations, Inc., which also owned and operated the historic WYFR Shortwave radio station from the mid 1970's until 2013, when it was sold. Below is a link to it's Wikipedia page. No doubt as a "DXer," it's a signal you've encountered many times! Et sympa de mentionner les DX'eur ! Donc c'est bien un reste de l'ancienne Family Radio en OC, super. et 2 auto-collants différents de pare-brise.